龍野は，現在　”たつの市”と表記を変えています。 龍野は，かつて，脇坂藩５万３千石の城下町として，また，産業の中心地として栄えました。 龍野の中心部を揖保川が流れ，素麺や醤油の産地として龍野を育みました。 現在も，武家屋敷や白壁の土蔵が残っており，「播磨の小京都」と呼ばれています。 また，「赤とんぼ」の作詞家・三木露風の生誕地でもあります。 In the old days, Tatsuno flourished as the castle town of Wakisaka Clan （53,000-goku),and as the financial center. Somen,and Soy sauce production became active because the area was blessed with clear flow of the Ibo River. 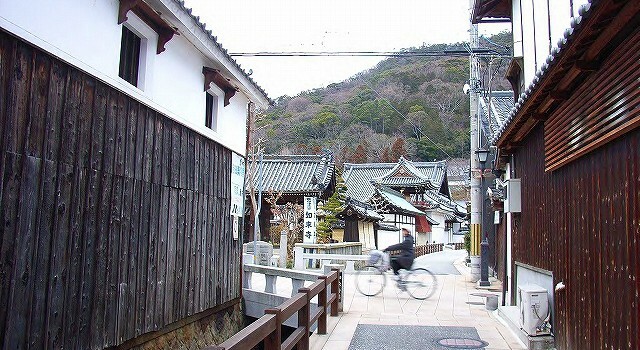 The samurai residences and the fireproof buildings with white plaster walls still remain today, so Tatsuno-city is often called ” a little Kyoto of Harima Province”. And, “Rofu Miki “, who wrote the lyrics of ” Aka-Tonbo” was born here.